Not since the early days of the sport has a single goggle design brought so much innovation. Long ago, our founder developed and entirely new goggle that became a mainstay in the sport for 17 years. 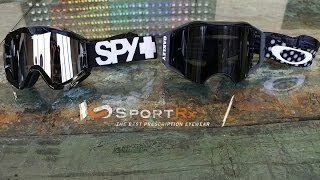 You are now looking at the future of MX goggles. Oakley Airbrake MX is the new standard of protection, clarity, comfort and convenience. Features include: Switchlock Technology, durable and adjustable straps. The Oakley Airbrake MX is one of many Oakley prescription goggles that we have available.